I want to share what I shared with my online coach training group – OPERATION: NO ONE GETS LEFT BEHIND﻿ today. “There are many things each and everyone in existence desires to achieve or accomplish. Many people have unspoken goals and dreams. They never vocalize them or share them with anyone. They leave them bottled up in their mind. There, they stay merely a wish or fantasy. Surround yourself with individuals who will in some way shape or form contribute towards you reaching your goals. I DO, however believe that it is of upmost importance and CRITICAL for you you to share your goals and dreams with those you closely associate with and be VERY clear and SPECIFIC as to what why it is important to you. If the people who are currently in your life belittle your ideas/dreams/goals or try to sabotage your quest towards a better life, as harsh as it may sound – It is time to get new friends, unless you wish to settle for a life unfulfilled dreams and a lifetime full of regrets. – Do you write down your goals? Short and long term? – Do your family members/close friends/peers know what your goals are? And do they know how important they are to you? Or do you shrink back at the first hint of opposition? Got me thinking – Earlier in the week, I had a chance to spend a few days with one of my childhood besties and personally sponsored coach, Melissa Barto﻿ and her family. It was late in the afternoon when they got to Lake Tahoe, where we met up for a few days. We had plans to go to dinner. Ryan was taking a nap and that’s when Thomas Barto﻿ said, “Let’s squeeze in a workout real quick, since we are all behind on our fitness schedule.” We all agreed, that we didn’t want to get all sweaty and have to wait for all 3 of us to take a shower before dinner, so we decided on 21 Day Fix﻿ Yoga The 21 day Knockout Nutrition Fix﻿. The next day, we were on the go all day and had stayed up super late, drinking beer in the hot tub, so we skipped our workout. The next day, right after breakfast, we decided to workout. It was NO joke, doing cardio at 7,000 elevation. So I was more than relieved when the 30 minute workout was over, but then Tom reminded me that we were still a day behind. I suggested we “do it later” (Procrastination at it’s best!). That’s when Melissa reminded me that I’d taken a quadruple shot of Energy & Endurance. How can you argue with two people who are encouraging you to do the RIGHT thing? (Most people have no time arguing with 1 person encouraging you to not workout, right?) So we did it. We completed 2 workouts, back-to-back. Even after 2 years of working out, I thought I was going to die a few times. Working out at a high elevation makes you feel like your lungs are going to collapse, but Tom kept pushing me to get up, keep moving and reminded me of what I know, but in exhaustion, quickly forgot – to put my hands up above my head when I got winded, instead of bending over and putting my head between my legs. MORAL OF THE STORY: Surround yourself with those who not only are aware of your goals and dreams, but who lift you higher and push you to be a better version of who you were yesterday! Be sure of what you want and stay loyal to your dreams and don’t change them regardless of how many people support you You MUST be passionate about something in life! COMMITMENT MEANS STAYING LOAY TO WHAT YOU SAID YOU WERE GOING TO DO LONG AFTER THE MOOD YOU SAID IT IN HAS LEFT YOU! 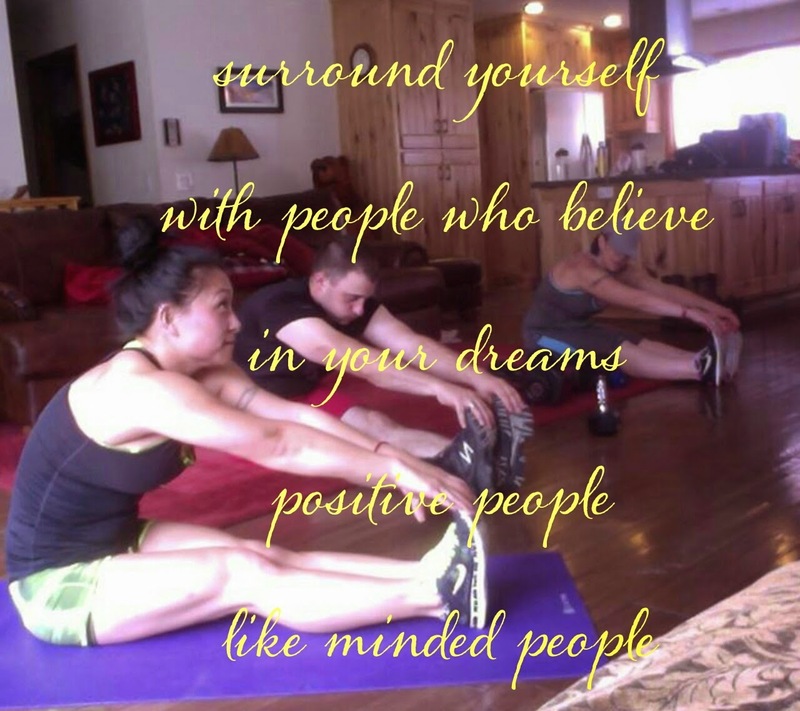 Surround yourself with those who lift you higher – Why you should NEVER miss a Beachbody event!